Editor's Note: This is the first in a three part series on the bubishi. Part 2 will discuss the text and its impact on Okinawan karate. Part 3 will discuss the availability of translations of the text in English, the text's impact on karate today and the current status of research on this text. It is an obscure martial arts text written in Chinese. But, it was a most cherished possession of many of the great founders of modern karate -- something that was meticulously hand copied and shared among only their most trusted students. It is called the bubishi. The bubishi's age and the origin are unknown. 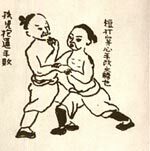 Yet, while the text remains a mystery, it is also the only historical written record of martial techniques and theory to have emerged from karate's shrouded past. Karate, as we know it, became known to the world in the early 20th century after emerging in Okinawa after centuries of secret practice. It was taught publicly for the first time around 1905. Its origins too remain obscure, tangled in a conflicting web of myth and oral tradition -- a mixture of native art (te, meaning hand) mixed with Chinese and other fighting traditions. In the 1930's the first public reference was made to the existence bubishi in the hands of senior Okinawan karate instructors. By this time karate had been introduced into Japan, and Okinawan martial artists had begun publishing books in Japanese to publicize and gain approval for their imported art. In 1934 when Kenwa Mabuni published "Seipai No Kenkyu" (Study of Seipai) the bubishi was named. Mabuni included the drawings from five chapters from Anko Itosu's copy of the bubishi (Itosu had been Mabuni's teacher and is considered the founder of shorin-ryu karate. Itosu first taught karate in public on Okinawa). Interestingly Mabuni dedicated more pages of his book to the bubishi (95, in fact) than he used for the purported subject of the book (79 pages), the kata Seipai. Now available in several English language renditions the bubishi, allows us to enter the world of mystery and possibility that so endeared the text to the founders of modern karate who we revere today. There is no definitive answer to where the bubishi originated, or even who wrote it. In the same light, we cannot even be sure who possessed copies for their own use. Prior to the 20th century, Okinawan martial artists did not document their arts. Karate was practiced in secret and many teachers were not literate. As a result, what is known of karate and its origin is the product of a relatively recent oral tradition. Thus, it becomes very difficult to prove any source or trace exact history. We don't know, however, if the bubishi was written or compiled in Southern China or on Okinawa. We do know it was written in Chinese. It could be a personal notebook of someone trained in White Crane and Monk Fist (Shaolin) kung fu arts. Equally it could be a compilation of martial arts notes from many sources. All of these copies of the bubishi are not identical. They contain different chapters and the drawings of the self-defense techniques vary somewhat in the strike being used and the target attacked. In sum, the bubishi is one part of the eclectic synthesis of karate as it developed on Okinawa in 19th and 20th centuries. Having only an oral tradition teachers exchanged knowledge and learned from each other, or visited China to study various Chinese Kung Fu styles. Others, like Funakoshi, sought to preserve the island's fighting heritage by recording and learning many ancient kata. Thus, the existence of a written fighting arts text (bubishi) was unique and considered important even if the text was not fully understood. As a result, many karate masters meticulously hand copied the bubishi and later published excerpts from it. What is not known is how much of the bubishi was understood by early 20th century karate teachers, or how much of its knowledge was adopted into the systems they pioneered. This article was initially authored by Victor Smith, but was edited with contributions of commentary, images and photo captions by Christopher Caile. (1) Joe Swift noted to this author that Miyagi had named Gojuryu from the Bubishi has been published in old Japanese karate books as well, and he had a 1942 article named after that precept (Miyagi that is). (2) It is therefore questionable how many could actually read or understand what was reproduced. The Funakoshi editions, it should be noted, only reproduced written text and not diagrams or drawings. In later reprinted English editions of Funakoshi's 1926 book, "Tote Jitsu," by Masters Publications, 1964, the translator noted that "I was unable to translate the Chinese style" and although several people were consulted, they "were also unable to help." The same segment from the bubishi was later published in the English version of "Karate-Do- Kyohan" published in 1973. 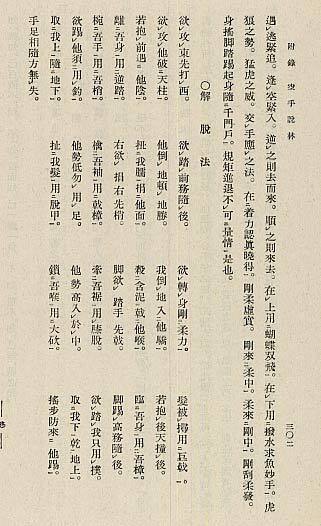 The translator noted that he was unable to locate the original source of the material reproduced that was written in the Chinese style. (3) The chapter titled, "Introduction of Part of bubishi," in Yamaguchi's book contained mostly (35 of the 38 pages) illustrations of self-defense moves and/or diagrams of the body's vulnerable points from the bubishi. The English translation of the book had no translations of the written text. (5) The Higashionna bubishi is mentioned by John Sells in his historical volume, "Unante-The Secrets of Karate." Higashionna may have been illiterate, and thus his version of the bubishi is a topic of some controversy. Was it his own journal, or given to him, possibly in Fujian, a province in China where he studied? (6) Ancient Okinawan Martial Arts, Volume Two - Koryu Uchinadi.